Are you wondering how to accept recurring payments on your WordPress forms? Generating revenue is often a website owner’s number one goal, and achieving that goal is whole lot easier when you can accept continual payments from repeat customers. In this article, we’ll show you how WPForms makes accepting recurring payments on your WordPress forms simple with Stripe so you can focus on more important aspects of building your business. Why Accepts Recurring Payments on Your WordPress Forms? You might be asking yourself why recurring payment functionality is important to have on your WordPress forms. Well, when it comes to generating revenue, forming solid relationships with long-term customers is the key to your success. It costs five times more to acquire a new customer than it does to maintain an existing customer. By giving existing customers the option to pay you on a regular basis for products or services, you save money and make money online with ease. Repeat business through recurring payments help forge better, longer-lasting relationships with your target audience. Enabling recurring payment functionality gives your business room to scale. Accepting recurring payments takes less effort on your part, and makes things easier on your customers too. Whether you have an online donation form, a user registration form to access locked content, or a simple order form that sells physical or even digital products, WPForms has you covered if you want to accept recurring payments. So, let’s take a look at how to enable recurring payment functionality on your WordPress forms using WPForms and Stripe. WPForms allows you to accept recurring payments on your forms using Stripe. That’s why the next step is to install and activate the Stripe addon. To do this, go to WPForms » Addon and find the one labeled Stripe addon. Next, go to WPForms » Add New to create a new form. For our example, we’ll create an online donation form that gives people the option to make a one-time donation or donate on a recurring basis. 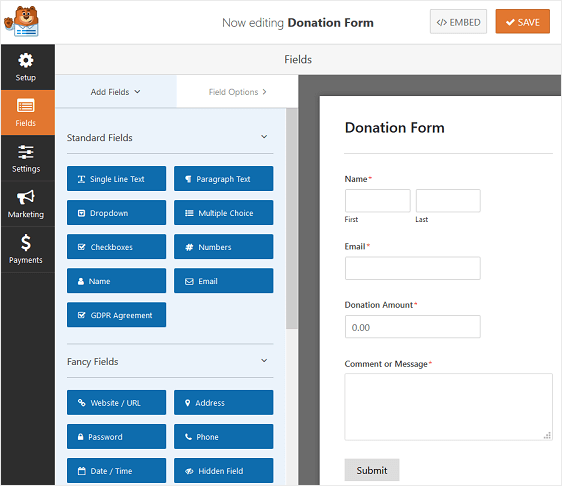 For help with this step, check out our tutorial on creating a nonprofit donation form in WordPress. This is what our donation form looks like before customizing any of the form fields. Then, click on the field to make any changes. You can also click on a form field and drag it to rearrange the order on your donation form. You can also add a Total form field so customers know exactly how much they’re being charged when they submit your form. 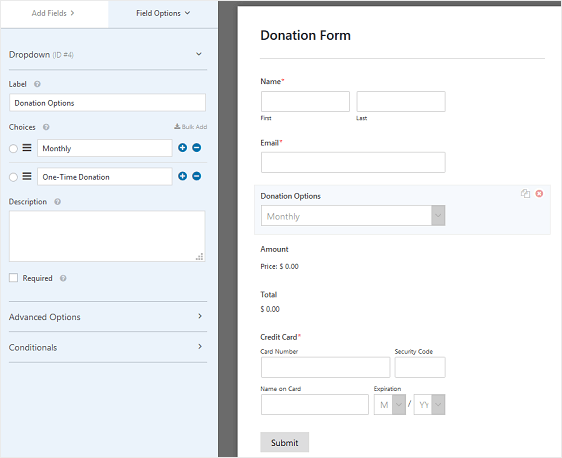 As you can see, we added a dropdown menu so people can choose whether they want to donate on a recurring basis or make a one-time payment, as well as a field for selecting how much people want to donate, a Total field, and the Credit Card field. When your form is ready, go to Payments » Stripe to configure the payment settings so your form can accept payments from people using the Stripe payment gateway. Next, click the checkbox labeled Enable Stripe payments, give your payment a description, and select Email as the Stripe Payment Receipt. If you were only accepting one-time donation from people, you would be all set. The next step would be to add your donation form to your website. However, you want to set up recurring donations so you have to continue customizing. To do this, scroll down a bit more on the Stripe settings panel and click the checkbox labeled Enable recurring subscription payments under the Subscriptions section. 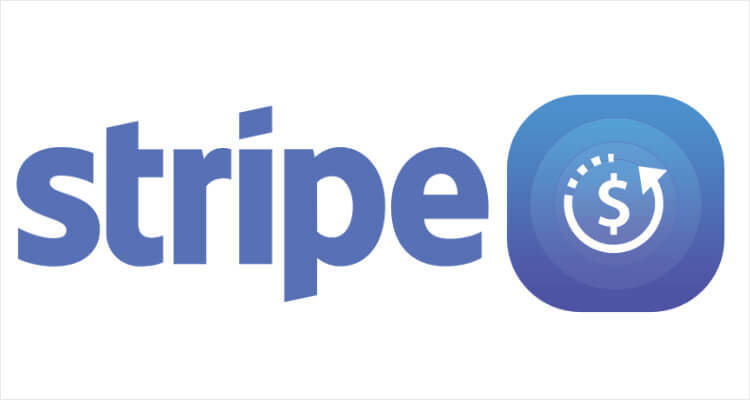 Plan Name: this is the title of the subscription and will appear on the Stripe transaction. Recurring Period: choose how often people will be able to make recurring payments. For instance, weekly, monthly, yearly, etc. Customer Email: by selecting Email from the dropdown menu, WPForms will be able to send a notification to the customer once they submit their form. Being able to contact people via the email they input on the form is required for Stripe recurring functionality to work. Lastly, you’ll need to set the conditional logic rules since you give people the option to make recurring donations or a one-time donation. To do this, first select the checkbox Enable conditional logic. 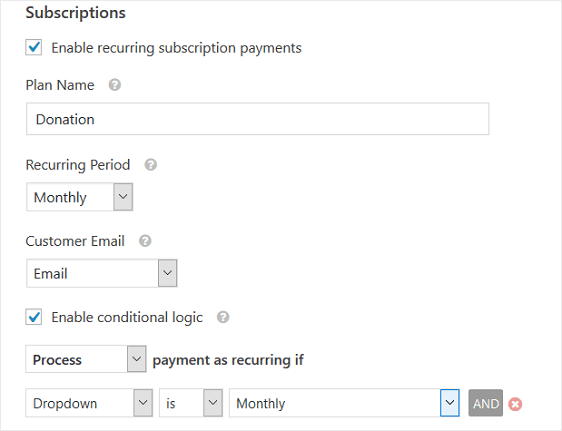 Then, to make things super simple, configure the rule to say: Process payment as recurring if Dropdown is Monthly. This way, any time someone wants to make recurring donations to your organization, their payment will process automatically according to the time interval you offered on your form. Before adding your donation form to your website, make sure to test it to make sure everything processes correctly. For help with this, we have documentation walking you through how to test Stripe payments before accepting actual payments. And there you have it! You now know how to accept recurring payments on your WordPress forms using the WPForms Stripe addon. If you’re ready to start accepting recurring payments, make sure to check out our article on how to combat order form abandonment so you can grow your sales, and donations, and maintain your success. Is there a way to charge a different first amount from the recurring amount? e.g. a 25% off coupon is applied to the purchase of the first billing cycle. Can we Setup Paypal for Recursive Payments instead of Stripe? Paypal is real simple. So i would like if it can be done with paypal.